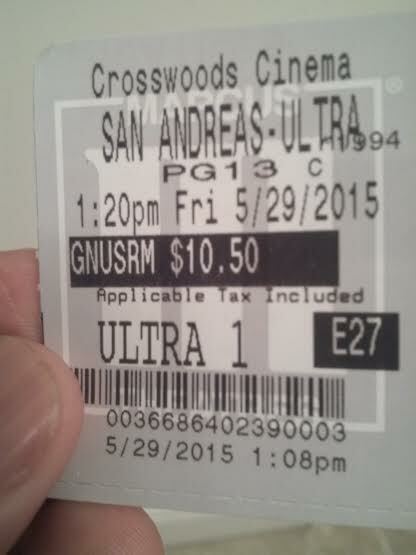 I’m not going going, back back, to Cali Cali after seeing San Andreas. In the Golden State, earthquakes are always a possibility, yet thankfully almost all aren’t Earth shattering. Yet according to professor and scientific seismologist Dr. Lawrence (Paul Giamatti), it is not if, but rather when, the fault spanning about 810 miles will release all of its pent up tension. After a precursor in Nevada, that moment unfortunately appears to be here. 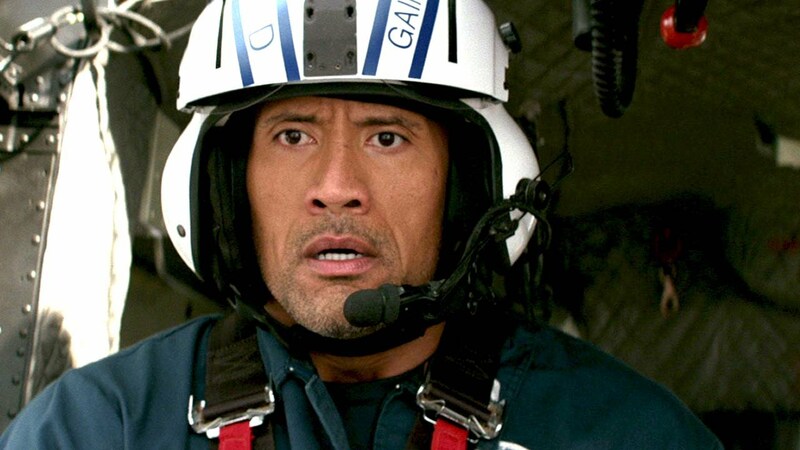 Rescue chopper pilot Chief Ray Gaines (Dwayne Johnson) is one of the aids called into assistance, and he is well versed in high pressure missions. But this is a different animal. Not only does he have to deal with Mother Nature, but he has to deal with an impending divorce of his estranged wife Emma (Carla Gugino), and separation from his daughter Blake (Alexandra Daddario), both of whom are in the eye of not just a singular earthquake, but multiple ones that hit harder than the last. A category, already in and of itself a and division of a group of things/people) that share similar concepts, traits, etc., can often always be broken down into smaller subcategories. Take, for example, the blockbuster film. Many blockbusters, occasionally a negatively-charged word in some circles, are often looped together under the same umbrella, and yet so many are different from one another. The “smart” blockbuster such as Inception and Dawn of the Planet of the Apes, as well as the “dumb” blockbuster like Furious 7 or Transformers. There is nothing wrong about either subcategory, to which probably more categories can be begot from them, but San Andreas probably falls in the latter one, and it seems to know that. And it is probably all the better for it. There is no real cause to explain the events in the movie (aside from the professor saying that the region is overdue for one), or social commentary that director Brad Peyton (Journey 2: The Mysterious Island) injects into it. This is a simple disaster movie through and through. Never more than five minutes go by once the earthquakes go down in which one doesn’t see multiple buildings collapse, land masses split open, or some type of explosion. It is all composed in sharp CGI detail, which is good-looking but not exactly anything that hasn’t been seen before. The action shots where people are frantically trying to get away from disaster are actually better than the wider shots. Unsurprisingly though, what isn’t disaster fare is comprised of family drama. 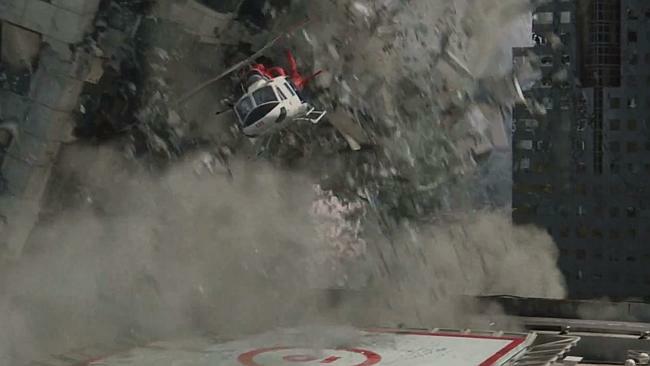 For a disaster movie, San Andreas is very much tunnel-vision-centric on its star characters playing the father, mother, and daughter. Credit goes to Johnson, Gugino, and Dadarrio for making the familiar notes tolerable, but that doesn’t make them feel any fresher. It is necessary I suppose to have the family bond here as it is something most could easily relate to in times like the film portrays, but this singular view sort of renders the beginning useless, especially as Peyton seem to paint Johnson and his rescue crew as…well, a crew that has been through a lot. After the 20 minute mark or so, we never see his members again, just Chief Gaines. Despite iffy writing, not much of the blame, if any, can be placed on those that appear in the feature. Dwayne Johnson may not be playing a complex character, but for what he is asked to do he does well, showing the requisite emotion that is needed in certain places. He is likable, magnetic, and a man that endears himself to others, and carries the movie well on his broad shoulders. Doesn’t hurt to know how to drop a chessy and over-dramatic liner seconds after dramatic music either. Carla Gugino is believable and functional as his wife, and they have the fractured relationship that is crystal clear on how it will end up. In a surprise to yours truly, Alexandra Daddario is more than the damsel daughter in distress, and gets to show off some real resolve and resourcefulness in the midst of disaster. Her character is no Imperator Furiosa or Rita Vrataski, but it is a nice turn to show that she isn’t completely a deer in headlights waiting to be rescued. As boring as the “it’s what you would expect line” is, it applies to San Andreas. It is entertaining, not deep, and a film that would feel weird if it weren’t released in the summer. Not a 10 on the ol’ blockbuster Richter scale, but more like a 6 or 7 in magnitude. Photo credits go to Youtube.com, nypost.com, theweek.com, ram-ah.com, and toughless.com. A summer movie through and through! Definitely knowing what I’m in for tonight when I finally get a chance to see it. I’m still looking forward to a good time. Good review MMJ. And a good time I believe you’ll have Tom. All in all, I really did. Though both of these films are blockbusters, I think they are both very very different. I do my best to try and not compare films to each other unless they’re really close in style and what not, but it sometimes happen. With that said, I didn’t think about Mad Max when putting my thoughts down on this. I honestly thought more about Twister and like minded films. I think an easier comparison between recent blockbusters is Fury Road and Furious 7. Not just the titles, but action wise they are both frenetic and awe-inspiring. Similarly, I gave both the same grade, and in a nutshell MMFR is an obviously better film (but I was disappointed in the plot, maybe I need to see the others and come back to watch), but I was honestly drawn more to Furious 7 if you held a gun to my head lol. FF7 over MMFR – Bite your tongue!! “D And yes, they are night & day different .. Max might have had a weak script..but did this film really have a strong one?? hahahahah Fast movies have drifted for me because now they are all about ‘missions’ and they used to be about cars.. And yes, you know I’m teasing you because everyone likes different things which is what makes movie watching fun! No matter you always write a great review and that’s helpful also! Nope, this one didn’t, and I think I talked about that in one of the paragraphs haha. It is functional enough for a disaster movie though. It is basically Twister if I remember correctly with earthquakes instead of tornadoes. Cheesy and over-dramatic, but somewhat endearing, to me at least. That’s what I’m finding. This movie is getting a mixed response from people, some (like admittedly myself) had not overwhelming, but some fun, where others have completely found no such enjoyment at all. Cinema Score has this as an average grade of A-, which doesn’t of course mean always a ton, but it appears a nice population found this to be fairly satisfying. Cinemascore is an effective tool to gauge how the public feels about a film. The audiences are notoriously forgiving however so virtually everything gets a B- or higher. With that said, an A- still means that audiences enjoyed the film so yes you are not alone! Sounds good enough to watch and get some summer flick enjoyment. Just go in with that mindset and I think (keyword: think) you’ll be alright! Had a great time with it and as you say it is exactly what you’d expect and in this case that wasn’t a bad thing really. I honestly was surprised at the level to which I had fun with this.